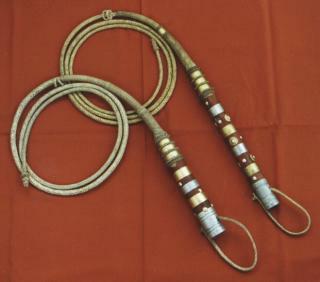 Two fancy bullwhips from Peru. note the construction of the transition zone, which is not done as a core but as a set of overlays of decreasing lengths. The handles are decorated with brass and steel rings, additionally some coins are applied! The little attachment after the transition zone is a closure to keep the whip coiled. Peruvian whips are not for cracking but made to hit!